New Acquisition: WW2 USGI Quality Hardware M1 carbine. I love my Mini-30 so much, when an opportunity to trade my 186 Mini-14 for a USGI M1 carbine popped up, I jumped on it. 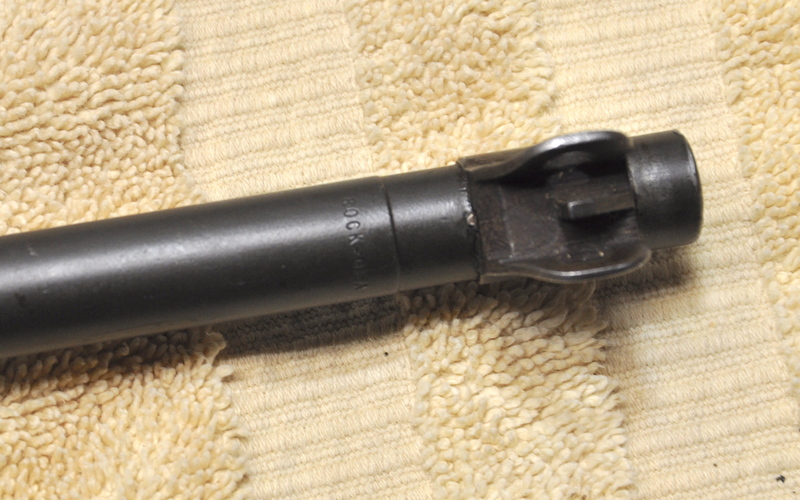 It was a CMP Service Grade Quality Hardware made in early 1944. 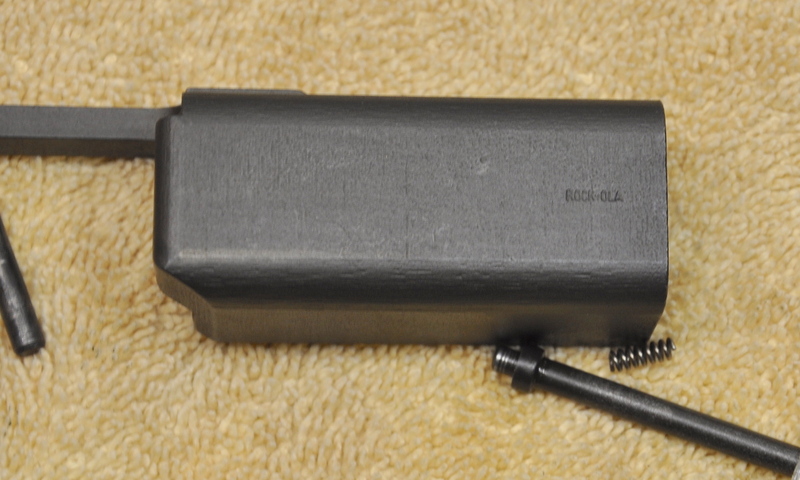 It has the correct original Rockola barrel and Quality Hardware bolt, but the rest is mix-master of Rock-Ola and Inland parts. ME is only "1" so it should be a great shooter! It was in an Italian stock with the FAT 77 arsenal stamp on it, but I found a correct Quality Hardware stock on Ebay for $70. I broke it all the way down to to a thorough cleaning and check and replace springs as needed. I have been working on Carbines since 1980, and still have extra NOS USGI springs and small parts. The recoil spring was degraded and was only 10" long. I replaced it with a NOS USGI that was 10 1/4". This thing had LOTS of cosmolene inside the trigger housing and bolt. I stripped it all down, cleaned it, and used Ballistol to lube. The ejector spring was solid with hard, dead cosmo, I pulled it out, cleaned out its channel, and replaced with a fresh NOS late model ejector and NOS spring. Extractor looks good, but I gave that a fresh NOS spring also. Before the haters say it is a pistol caliber, realize that it has a 110 grain soft point traveling at 1970 fps, generating more than 950 ft lbs ME. Hundreds of thousands of enemy combatants in three wars a dead because of the M1 Carbine. It was designed as a 5.5 pound, light and handy PDW. Under 150 yards it works great. Try to use it as a rifle, at 300 yards, not so much. In Korea, it got a bad rep because they were untrained at full auto fire (from the M2s), and tried to use it as a rifle at 300 and 400 yards. In the Pacific, in the towns and villages of Europe, and in Vietnam where is was closer fighting it worked. My dad fought with an M1 carbine on Iwo Jima, and said it never failed him. I carried one as an LEO trunk weapon for years, and even killed a 200 lb Blacktail buck at 100 yards with a single heart lung shot with an R-P 110 JSP. I have ARs, and a Mini-30. They are great. The M1 Carbine, loaded with Hornady Critical Defense 110s at 2000 fps, however, will be my home defensive carbine. Last edited by imarangemaster; 03-08-2019 at 6:22 PM..
Great trade, as the M1carbine will continue to go up in value,more than the mini. Last edited by imarangemaster; 03-08-2019 at 8:32 PM..
M1 Carbine are fun shooters and a compact upgrade as a Home Defense weapon for most Pistol Shooters..........now with a tabooed M1A1 Stock? If the information at this site is correct, my M1 carbine's serial number indicates that it was among the first 7000 carbines made by Quality Hardware. I've had the carbine for many years, but I haven't really examined it in fine detail. I don't shoot it, but on the rare occasion when I do shoot an M1 carbine, I use my commercial IAI M1 carbine instead. Years ago, I had a very collectable, 95% finish all original Inland that I was reluctant to shoot. I got it from the estate of a local family of a recently deceased WW 2 officer. If I had to replace anything on it, it would no longer be original. The Mixmasters I have had, however, I don't hesitate to shoot. In fact, I can't wait to shoot this one. Unfortunately, I had knee surgery Wednesday, and it will be a week or so until I can take myself to the range. Good trade rangemaster, I have my grandfather's M1 carbine I have yet to shoot it. Back in the day when I carried one as a deputy in the 80s and 90s, I often had the M-1 Carbine in an M1A1 stock. When I was in the USAF Reserve in the late 70s, we still had some M2 Carbines in the arms room. Pretty cool, and good full auto if you kept it at 2-3 shot bursts. Later, when I was a rangemaster at a PD in the Seattle area, we played with an M2 in a M1A1 stock for an entry weapon. I have about 500 rounds of factory JSP for it, and am loading up another 500 rounds of Rainier Bullets copper plated 110s. I use 14.7 grains of WW296 and Wolf small rifle primers. My 67 year old three times rebuilt right shoulder doesn't do shotguns anymore, so this is perfect for an HD weapon. Moving back to our house in a neighborhood with houses on 1/2 acre lots, my Mini-30 is a bit too stout for HD with close neighbors. Last edited by imarangemaster; 03-10-2019 at 7:39 PM..
Well now... Though I live in a area in the mountains where everyone has 3-20 acres, (moving back in closer to town in June) I generally refrain from shooting where I live, except whacking coyote that come in too close to the house. I decided however, a couple shots from the carbine would not irritate the neighbors, as occasional gunshots in these woods are fairly common. that I wanted to see how close the Type II sight was. The sight housing is centered in the bridge, and the sight ramp is about centered in the housing. 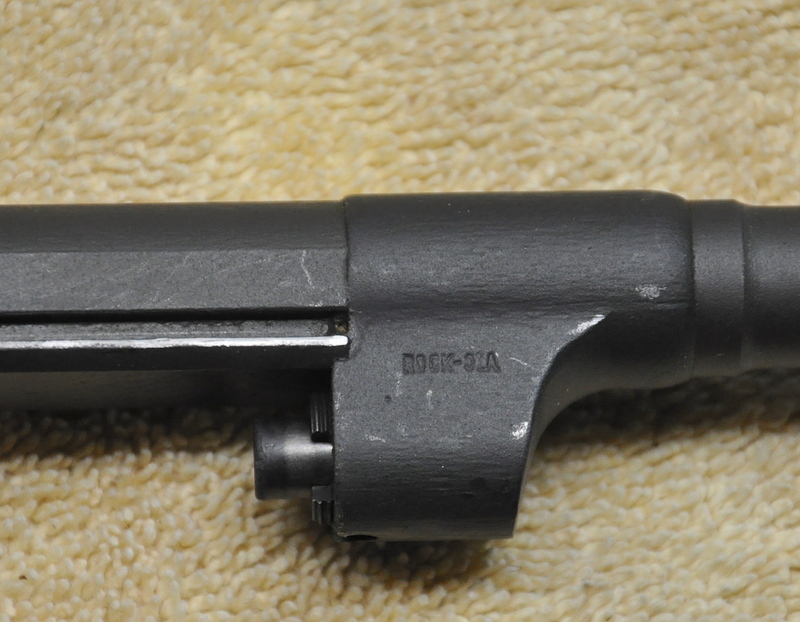 It appears to have the original, unaltered front sight. Leaning on the back deck, I held a 6 o'clock hold on a softball sized rock (crumbly decomposed granite) about 80 yards away, and fired a shot of my Rainier copper plated lead 110s over 14.6 grains of WW296. Smacked the rock dead center and made it into gravel. Sighted on another crumbly rock 5 yards farther and duplicated it! I will dial it in at the range later, but that seems pretty good to me! A nice daylight picture of the Quality Hardware, Also, when I sold my last carbine, I kept my ammo, mags and, and reloading stuff. I have 600 loaded factory (mostly JSP) and another 600 of my reloads. Pretty well set up. The mags mostly go back to the 80s and 90s when I carried it as my LEO trunk weapon as a Deputy. (10) 30 round seven are J, OKay, AI and SEY, and three are commercial. One is absolutely identical to the USGI, and two are decent aftermarkets that function well. I also have (18) of the 15 rounders. Last edited by imarangemaster; 03-15-2019 at 12:14 PM..
80's and 90's might have been when you got the magazines, but they were probably made in the 50's and 60's. The 15s are all WW II, of various makes. The AI and SEY 30s and either late WW II or Korea. The J are "Jahn," an early Vietnam contract 1960s , and the OKay (who bought Jahn) are late Vietnam 1970s. OKay also made M16 30 rounders. The three commercial 30s I picked up in the 90s. I have since replaced the springs in all the 30s with replacements made by OKay that Chesnut Ridge was selling 10 years ago. Most of the 15s (12) have NOS USGI springs I got from Numrich in a bundle (in wax paper soaked with cosmolene) about the same time frame. Through the years, I have probably fired almost as many rounds through the carbines as my AR15s. (except when I was in the service). Last edited by imarangemaster; 03-15-2019 at 1:28 PM.. The three commercial 30s I picked up in the 90s. I bought some M1 Carbine 30 rounders in the early 1990's right after I got my Quality Hardware M1 Carbine. They are the "split back" variety with the two slits on the rear side where the magazine bends. They are unmarked but I think they are commercial. They all failed to feed properly until I re-worked the magazine feed lips. So there are some duds out there with these commercial M1 Carbine magazines. I later read this online article (written in 1998) at Fulton Armory about M1 Carbine magazines. Since then, there has been a lot more info on 30s. J are made by Jahn in the 1960s for the Defense Department. Jahn also made M16 BCGs for the military. In the early 1970, OKay bought out Jahn, and continued making M1 Carbine 30s with the OKay marking. 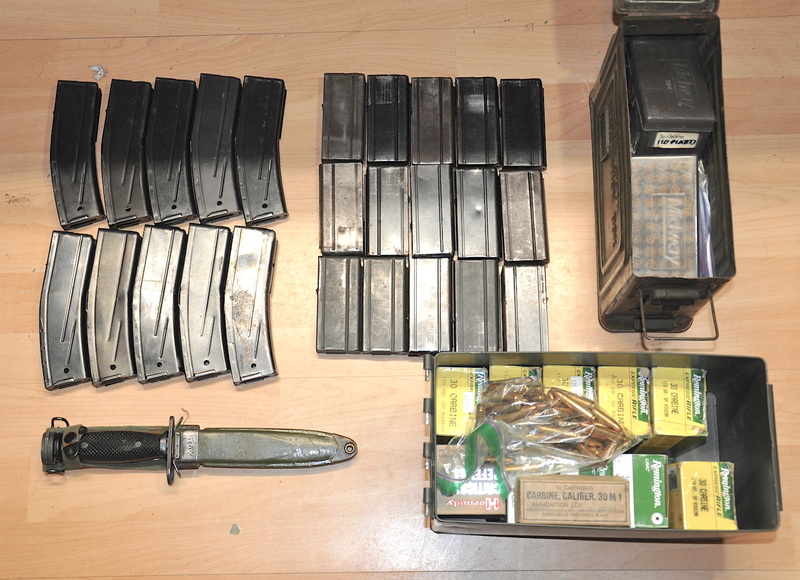 They also produced 30 round M16 magazines for the military. Some of the commercials are almost as good as GI. They have crisp corners, and the same gauge steel. They weigh the same as GI. Other after markets range from so-so to junk. My commercial that has made in USA on the back by the feed lips weighs the same and feeds excellent, especially since I put a new GI spring in it. My two cheaper commercials, I have not shot since I put GI springs in them. They had horrible, short, cheap springs I replaced. My GI and the USA marked all weigh 12.5 to 12.8 grams. The two so-so commercials are thinner steel, and weigh about 11.4 grams, even though they have the same springs as my GI. Last edited by imarangemaster; 03-16-2019 at 10:02 AM..
From conversations I've had with old-timers, you were fortunate to get the aftermarket split-back 30's up and running. This was a good read. I appreciate the write up you did on your rifle and what was replaced with everything. Gives me a great idea on what I need to do with my rifle and 15 Rd mags and 30rd mags j bought. I got shafted on gunbroker with 30rd commercial mags instead of usgi so I'm praying they work. I'll replace the springs in those and maybe replace the springs in the 15rd mags? Idk. Gotta scrub up the 15 Rd mags too since they're moderate/severely rusted . $70 for a Quality Hardware stock?!! I've been looking and any time one comes up, it rockets up much much higher than that. Go to the CMP forum, they sell on there regularly. Mine is just a Bluesky Import but man it shoots straight and great and is a fun shooter. +1 on keeping it a shooter as it is meant to be. Nice gun. What do you use to dissolve the cosmoline? I got some AK mags to clean. Lots of "Quality" in this post. I love discussion threads about the M1 Carbine. I've posted pictures of my QH M1 carbine before on Calguns, but here it is show and tell again since this thread is specific to Quality Hardware M1 carbines. Mine has been through the Mount Rainer Ordnance Depot. It seems that there are some pretty nice ones out there. I wish I had one of those M1 Carbines that say "UN-QUALITY" on the receiver as a companion rifle. Last edited by loademup; 04-13-2019 at 8:15 AM.. I've got a near equivalent I might sell you, it says Universal on the receiver. I really do. Registration is the first step towards confiscation. Hunt them with Rottweilers and shotguns. Drive them underground into the sewers. It was really dirty and had a small crack that I repaired. Ended up nice. First production Universals used almost all GI parts, and fit in USGI stocks. They were pretty good little guns, about on a par with Planefield and Iver Johnson. Final production Universal, not so much. Either boiling water with some dish soap or mineral spirits. That is a very beautiful rifle! Wish I had the coin to buy either an M1 Carbine or its M1 Garand Cousin. Sounds like a weird question, but why did police departments slowly phase out the M1 Carbine, when rifles like the AR and Mini 14 were cumbersome to be used on a daily basis? I strongly believe that the M1 Carbine could have ended both the Norco and North Hollywood shootouts much quicker and safer. I carried all 3 (Mini, M1 Carbine, and AR) as LEO trunk weapons. Part of the reason i perception, and part is wanting to stay modern, as USGI M1 Carbines are 75 years old. Personally, I think the M1 Carbine is better in high density population areas, but that is just me. Current 580 series Minis, especially the Mini-30 do what an M1 Carbine does better. The AR15 is a better battle rifle, for sure, but how many tens or hundreds of thousands of enemy combatants were killed by 6.5 Million M1 Carbines in three wars. It worked excellent in the Pacific and Vietnam where fighting was close up and personal. (My dad fought with an Inland on Iwo Jima) In Korea, its main problem was trying to use it as a rifle at 200 to 300 yards on the open hillsides and mass attacks. Ola Mize won the Medal of Honor killing a bunch of Chinese with his M2 Carbine, though. In Europe, it was better in towns and villages, than it was in open county. The Janitor at our parish grammar school in Chicago (in the 50s and 60s) was a NCO that landed on Normandy. I got to know him as a teen when I worked with him around the parish when I was in High School. He carried a rifle in the open country side, but when they had to clean out a village, he traded with his RTO to get the RTOs carbine. He said it "made a lot of the "bad Jerries" into "good Jerries". I truly enjoyed reading your personal anecdotes on your experiences about the M1 carbine, and those who served in World War 2 with such awesome vintage rifles. As much as the gun companies peddle the AR and even the Mini-14 as modern weapons for war, none of them can beat the M1 carbine in terms of reliability and lifespan. That "ping" it makes everytime it fires a shot is music to my ears ( i have seen too many m1 carbine videos lately). In terms of symbolic status, the M1 Carbine is an iconic image of World War 2 due to how many enemies it dispatched away quickly in countless engagements! As for the future, I hope more firearm hobbyists adopt the M1 Carbine or its modern reproductions as a mainstream weapon. The problem I have seen with the AR 15 and the modern battle rifles, is the difficulty in field stripping and even replacing a few springs means the potential for lower receiver components to become lost along the way! The M1 Carbine with some TLC and lubricant will easily continue going for 20 or more years. You just dont get that quality level of craftsmanship in firearms anymore. And as the 75th anniversary of D-Day comes this June 6th, the M1 carbine is remembered as the rifle that liberated Europe, as the Paratroopers carried the M1 behind enemy lines and set the groundwork for the D-Day invasion at Utah, Omaha, and Juno among other beaches that fateful day. That day decided the outcome of World War 2 and turned the tide towards an Allied Victory. I can certainly understand your appreciation for the Carbine. Just last week I was shooting both an IBM and an AR, and I enjoyed them both equally. But to claim that field stripping an AR or any other modern military-based rifle is somehow difficult really misses the mark. 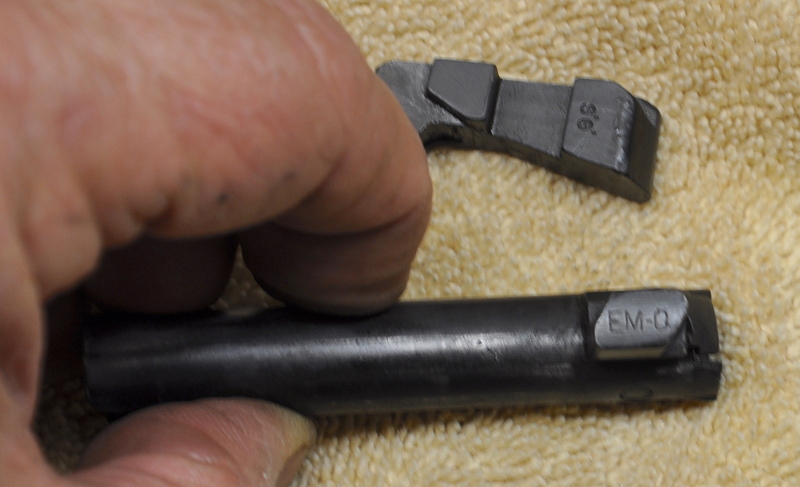 Pop out a captured rear pin, pull charging handle part way, and the bcg drops out. Done. What springs pop out when I field strip an AR? Or an AK? Or a Tavor? Or a SCAR, etc? I guess it's conceivable that a foot-long spring gets lost, but that's really pushing believeabilty. For that matter, what tools do I need to field strip any of them? None. Ok, a bullet tip comes in handy sometimes on some models. But for the carbine I can't disassemble anything without a screwdriver. And I'm more likely to lose that screw than I am to lose an AR part in a field strip. Even the craftsmanship part, have you seen the machine marks inside the receiver? I'd prefer the cleanness of modern CNC machining over those grind marks any day. Admittedly they don't matter for reliability, but we're going on the craftsmanship angle. As for modern reproductions of the carbine...eh...NO. Like I started with, the Carbine is a great gun. Yes you're right it is iconic. But don't compare it to a modern gun & try to say it matches it. Let it stand on its own. With all due respect, I have field stripped both rifles at some point, and the AR has a bit too many springs that can become easily lost. Although it may seem easy to get AR parts right now, the draconian California Gun Laws are proof of how even something as popular as an AR Rifle can become illegal with the stroke of a pen. M1 Carbines and Mini 14 rifles are almost the last rifles to be potentially banned by the gun grabber politicians. Although it may be extremely tempting to fire away with a highly rare M1 carbine, the historical value alone makes many collectors cringe at the thought of taking out a "safe queen" for a drive at the range, because the risk for damage or theft is very exponentially high. A quality M1 carbine reproduction rifle is ideal to shoot and kick around and at the end of the day, if lost or damaged aka broken-hairline cracked stock, I dont need to worry about destroying a historical icon in the process. The machining from a WW2 rifle and a modern-era AR is like comparing apples and oranges. Its like comparing a 1947 Ford Coupe to a 2017 Ford Sedan. The method of manufacturing and capabilities are designed for two different generations. Your mileage and preferences might vary, but some people love classic cars and others love the latest and newest car with all the gizmos. For me, I feel that an M1 Carbine or its equivalent is ideal for home defense, because its friendlier to shoot and extremely easy to use. An AR might have many quality calibers to pick from, but without further youtube study, it can be hard for new people to shoot easily. The reason I recommend an M1 Carbine as a starter weapon is to get more people into this hobby of target shooting or home defense, without many burdens on new shooters. But don't compare it to a modern gun & try to say it matches it. Let it stand on its own. I like modern guns and old guns equally, for different reasons, but I'm not going to compare them on the same criteria. I doubt you're the only one who's field stripped both a M1 Carbine & an AR. Did you miss the part where I mentioned I have an IBM mfg one? I do like to "fire away" with it though, because I don't own safe queens. I take care of it, definitely, and I don't do mag dumps; but there is no "exponential" risk of, really, anything vs taking out an AR or an AK, etc. That 500 rounds (max) that I put through it a year are not going to wear anything out. I am still wondering what springs you have on your AR that pop out so easily & get lost...seriously, the only one on mine that pops out without any tool is the buffer spring. And it's hard to lose a foot-long spring. All those other little detent springs or trigger spring, they're not coming out in a field strip. For that matter they're not coming out, ever. I have been to ranges where the crowd is sketchy enough that firearms are stolen if not watched the whole time. I am glad you own an M1 Carbine, but as time passes, it becomes extremely hard to find parts that were common at one time. As for the AR, if you change the trigger group or want to install a nicer buttstock on it, those springs become a pain in the rear to say it nicely. I'm sure that there are a ton of these that are short strocking and ftf'ing in the hands of younger guys that do 't have anyone to trouble shoot these old relics. Last edited by user name; 04-16-2019 at 6:01 AM..